Dental Crowns - Mark T. Albers, D.D.S. Dental crowns help us restore strength and function to an otherwise weakened tooth. They are an important part of what we do in our office, and come in three basic forms: All ceramic, gold, and ceramic fused to metal. Most of the dental crowns our office places are all ceramic crowns. Most of these are same day crowns made with our E4D Dentist™ system. All ceramic crowns are a good choice for most patients as they provide the support necessary to help protect the tooth, but do so in a cosmetically pleasing way. 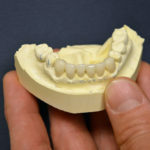 Most crowns placed on teeth towards the front of a patient’s mouth will be all ceramic crowns. If a patient needs a crown on a tooth in the back of the mouth, Dr. Albers often recommends using a gold crown. 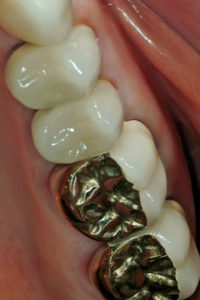 While crowns made of gold are not as aesthetically pleasing to patients, they are more durable than all ceramic crowns. This becomes important when the teeth involved are molars, the teeth at the very back of your mouth used for chewing. While Dr. Albers can explain different options and make recommendations, the patient will make the final decision. On rare occasions, Dr. Albers might recommend a porcelain fused to metal crown (PFM). This type of crown has a metal substructure with porcelain overlaid on top of the metal. If a patient has decay under the gum line, a PFM crown can be made with a thinner collar of material, making it fit better over the tooth. The porcelain overlay of a PFM maintains a pleasing cosmetic appearance for the patient. This photo shows four PFM crowns – two with porcelain around the sides, and two with porcelain covering the sides and bottom of the metal. Although porcelain fused to metal crowns have been good options for patients in the past, they are used less frequently now. This stems from the fact that newer ceramic crowns have greater strength and durability than they used to. Dental crowns play a big role in protecting teeth from further deterioration. They are both restorative – meaning they are helping maintain tooth structure and function – and cosmetic, as they can restore a natural looking smile. See this short informative video about crowns at Mouth Healthy, a website maintained by the American Dental Association (ADA). Bottom line, Dr. Albers and his staff have the experience necessary to help patients determine what type of crown best meets their needs.